"Post-rock" is a term much abused - bands dislike the label and fans are polarised over its quality. In the case of Vessels, though, it's clear they're doing as much as they can both inside and outside the genre. Hailing from Leeds in the UK and recording with industry leaders like John Congleton (of Explosions In The Sky fame), they're destined for bigger things than genre buzzwords. SPB's Matt A and Matt T sat down with Lee and Martin to discuss inspiration, local scenes, and The Mars Volta getting "back on the crack". Scene Point Blank (Matt T): Hello! Do you want to kick off by giving us your names and what you do in the band? Vessels (Martin): I'm Martin, I play bass and guitar. Vessels (Lee): I'm Lee, I play guitars, keys and drums and I do programming as well. Vessels (Martin): And the singing! Vessels (Lee): Oh yeah, I do singing as well. Scene Point Blank (Matt T): All-rounder, nice. Ok, you're two days into your tour. How's it going? Vessels (Martin): It's ok, yeah. We've played two shows, one in Preston and one in Cambridge so they were both quite a good attendance. It always takes a few days to get into the tour, into the playing and stuff. But it's going ok. Scene Point Blank (Matt A): Does playing in Leeds feel a bit like a homecoming gig? Do all your mates come out? Vessels (Martin): Yeah, we usually have a few mates who come out to the shows which is nice. And it's always nice to play the Brudenell Social, it's a lovely venue. Scene Point Blank (Matt T): Ok, kicking off with some stuff about the album – a lot of the music is quite intricate, a lot of the songs are quite intricately put together. What's your writing technique? Vessels (Lee): We have two or three different ways it seems to come together. We either jam out, just stick a microphone in the middle of the room. Well, we do this anyway. We record absolutely everything that we jam and trawl back through it to find the good bits. That's one way, we sort of play around with things and sometimes we'll stumble across something that's really cool. Other times I'll write a lot of riffs and bring sections of songs that I've put together. Sometimes I'll have a whole song, most of the time it's bits and riffs. And then we'll go through those and figure out the bits around them. Sometimes I'll come up with the whole thing but then it gets stripped apart and bits get thrown away. A song we've been working on recently – we're not playing it tonight because it's not finished – the guys just went and recorded shitloads of samples . Zithers, toy microphones being hit and stuff like that. And the next day they presented me with a load of samples that they had made and by that evening I'd put it all together and put an electronic tune around it. So we've pretty much written a song around that, which is cool. Sometimes we do things like that and sometimes it just comes from one theme. Just one line that you think is wicked and you just build up on it. It's pretty varied. Vessels (Martin): There's usually a good amount of arguing and debating and messing around with stuff. We'll do something one way and then we'll change it and argue about it and then about a month later we might end up with a song. Vessels (Lee): Sometimes they'll get shelved. We've got loads of stuff – we tried to get some new stuff finished for this tour but we started loads of new ideas and none of them are really finished apart from this electronic tune which is about two-thirds of the way there. But sometimes they get shelved for ages. Then someone will go "Remember that thing we were doing?" and we'll go "What thing?" And we'll trawl back through and realise you've written another thing to connect it together with . Vessels (Martin): And sometimes they get shelved forever. But usually that's for a good reason. Scene Point Blank (Matt T): Cool. You have quite a layered sound, there's a lot of instrumentation. Presumably because you play a lot of different instruments! Are there any challenges in transferring your recorded material to a live environment? Vessels (Lee): No, because if we can't do it live we generally don't record it. And we try and get the sound as close as possible to how we want it. We're not one of those bands who just turns up and lets the sound engineer deal with it. We try hard to get all our levels as set as possible. Vessels (Martin): Sometimes you do something in the studio and the producer might have made something sound really cool and it's challenging to recreate it live. 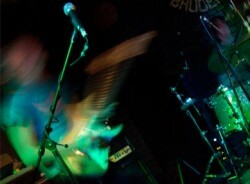 But generally, most of the stuff we do we play live. And most of the recording is live, with bits and pieces added on top. Vessels (Lee): Most of the stuff you hear on the album is the live take. Scene Point Blank (Matt T): Ok. Post-rock. Scene Point Blank (Matt T): A pretty abstract term and genre. Do you see yourself as fitting into any post-rock scene or do you think that the term is a non-entity? 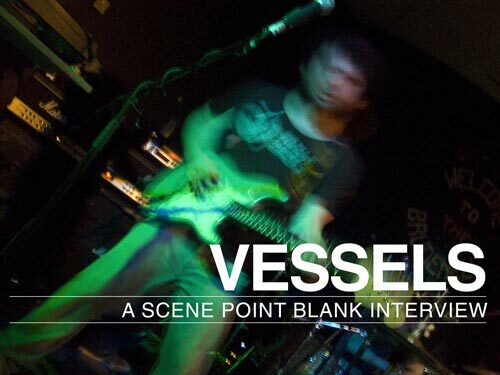 Vessels (Lee): We've certainly taken a lot of influence from post-rock and it's obviously evident in the music. The term 'post-rock' is expansive but at the same time it also narrows the field a little bit. When you say it's a post-rock band you immediately have a sound in your head that you associate to post-rock so obviously it does have a pigeonhole and it can sound generic. And a lot of bands do sound generic. And a lot of people talk about it being a dying genre, monkeys with typewriters and all that stuff. I don't really like being labelled as a post-rock band because we try and do a lot of other things with electronics and the math stuff as well. But if it helps people get an idea of what we're doing, if they haven't heard us before, then fair enough I guess. But as a genre it's kind of weird. There's a lot of scope – there's people trying to push the boundaries out but there's also that kind of quiet-loud thing that's been done to death. Scene Point Blank (Matt T): The Mogwai aesthetic. Vessels (Lee): Well, yeah. And Mono, and Explosions. I think Explosions have a lot to answer for, for making it a bit generic. Not that they are, but I think a lot of people realised that it was fairly easy to reproduce after seeing them. Personally I'd like to move away from it. Move into Prog. Scene Point Blank (Matt T): It's the next big thing. Vessels (Lee): Yeah. More keyboards. Scene Point Blank (Matt T): Music scenes are a funny thing these days – they've gone almost as much global as they are local. Specifically through file sharing, forums, things like Last FM and Spotify. Do you feel like you're more part of a Leeds scene or a global scene? Vessels (Martin): A bit of both. There's a good selection of bands who do a whole range of music in Leeds and we've got a lot of friends in the Leeds music scene and most people know each other. But at the same time I don't spend most of my time listening to bands from Leeds. It's a great scene, the Brudenell Social is an awesome venue and there are some really good local bands. Vessels (Lee): It's the great thing about the internet. You get to see who is listening to your music. It is nice to see people in Texas listening to it and people in Tokyo listening to it. I don't think we've got as much of a presence globally as we do in England. It feels almost more like it's at a national level now, so we're working at that. And when we've established ourselves a bit more as a UK band rather than a Leeds band I think I'll prefer that. Vessels (Martin): It's funny how things work out. There are some bands from Leeds that are really popular in Japan and nobody has ever heard of them in Leeds. So far we've just done UK touring and we're about to do our first shows in Europe at the end of the tour. And hopefully we'll end up in America and Japan eventually. Words by Matt T. on Oct. 16, 2010, 10:05 p.m.
Posted by Matt T. on Oct. 16, 2010, 10:05 p.m.
Posted Sept. 17, 2012, 12:29 p.m.